Save on food storage organization by entering to win the Harvest 72″ Rotation System from Shelf Reliance a $459.99 value. I can just picture this beautiful organized food storage area with all my cans neatly organized. Here’s a description of their awesome rotation system: “Food storage management has never been easier thanks to the Harvest 72″. Featuring patented front-loading technology that automatically rotates cans on a first in first out basis, the Harvest 72″ is the largest, most popular food rotation system offered by Shelf Reliance. This FRS is easy to adjust for different can sizes and boasts the capacity to hold up to 600 cans. With its easy-fit design and unique features, the Harvest 72″ makes food storage management a breeze. These things look heavy, luckily they will ship it for free too! BTW we posted this because we entered the drawing to win the rotation system, after all we want one too. But it’s fair game, so just enter to win it for yourself. 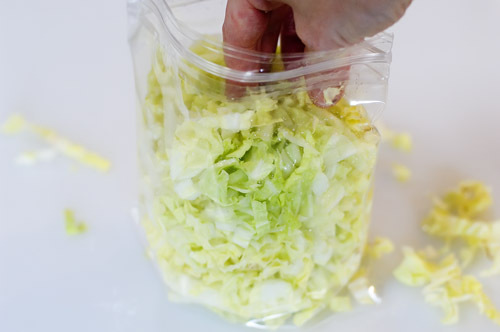 Keep packaged salad mixes in a new zip lock bag with a couple of paper towels in it. container has a tight fitting lid! Change the water every week or so. Storage of water is one of the simplest but most neglected areas of emergency preparedness. Many people store dried storage foods such as powdered milk, beans, rice, etc. which required water for eating. One gallon of water weighs 8 lbs. Water is more essential than food in sustaining life. How much water do I store? 1 gallon per person per day, which is bare minimum survival. 3 gallons needed for enough water for personal hygiene, doing dishes. 4 gallons to have enough for more personal care, to wash clothing and minimal cleaning. Click here to order these water tanks online. Kind of pricey but worth it! Water must be stored in clean containers and out of sunlight. If stored properly water should have an indefinite shelf life. It is advised that you trade out your water every 6 to 12 months. (Suggested every Oct. Conference or when you change your clocks.) After sitting for a while water will taste flat. You will need to pour it between containers to aerate. How can I store water? Any bottles that come with food liquid in them (except oil) can be used. DO NOT USE Milk and oil containers! DO NOT use metal containers! Dish washing soap bottles, liquid laundry soap bottles & dish washing soap, liquid soap bottles too. After you use it all up, don’t rinse it out. Fill with water and label it soapy water. That way you will have it to use for sanitation and not have to use precious drinking water Cooking, washing dishes, cleaning, personal hygiene, etc. Where can I store water? Water is bulky, but in smaller containers you can tuck here and there. Behind beds and under beds. You can tie a piece of twine or rope around the neck of 2 liter containers, mount a 2×4 along storage walls and hook the liter bottles over nails on those boards. These can be run high next to the ceiling to use otherwise wasted space in storage areas. Warning: Be sure and keep water out of sunlight, heat and off of concrete floors. It is not necessary to treat water from a public water supply if it is already chlorinated. Clorox - Amounts according to civil defense guidelines. Double if water is cloudy. After adding proper dosage, stir and allow to stand about 30 minutes. Boiling - Most water can be purified for drinking purposes by boiling it for 5 to 10 minutes. Purification Tablets - Tablets that release iodine may be used safely to purify drinking water. Click on the image below to view all 52 weeks at once or download the 52 Week Purchasing Plan in PDF format here. Cases of #10 cans as furniture. Cases of 6 #10 cans, available at the cannery, are convenient to use as stand-in furniture for things you may not have when first setting up house. Because these boxes are all the same size, you can use them like Legos to “build” the furniture you need. We placed our TV on a stack of 3 boxes covered with a tablecloth when we were newlyweds, because we didn’t have a TV stand. After my babies were born, I slept in a recliner moved into the master bedroom for a few weeks. I needed a place to put my drink, so we made an end table out of 4 cases of food storage. You could use the same idea for a temporary night stand.Cases of #10 Cans as Bed Frame. We used food storage boxes to build a guest bed. We had a cheap air mattress, but it’s hard to get up from an air mattress flat on the floor. We raised it up with food storage boxes stacked two deep. We also put one layer of food storage boxes under my oldest child’s bed. You can fit a surprising amount of food under a bed. Food storage under furniture. Can a few boxes fit under a night stand? We considered putting some food storage boxes in our old couch. The springs were old, and anyone who sat on that couch sank down too low. We thought about getting rid of the springs under the cushions, filling the area with food storage boxes, and replacing the cushions on top. It might have made the couch more comfortable, but we never tried it out. Using space in creative ways. Think creatively about the space available. Many homes have corners that aren’t being used. In our first home, the master bedroom was larger than we needed. We had extra room along one wall, so we stacked food storage boxes neatly along that wall. Food usually isn’t stored in the master bedroom, but that was the space we had available, so we used it. We also had half a wall available in a child’s room. We placed a steel shelving unit from Home Depot in there and stacked bulk purchased groceries in there, being sure to store the extra chocolate chips out of the reach of the kids. We should have covered up the shelves with a curtain or something to make it look better, but we never got around to it. Closets? Think creatively about closet space too. If you have an extra linen closet, consider storing food there. We opted to store extra sheets in the garage so we could store extra food in the house. We lived in the desert where the food would not have stored well in the garage. Crawl space. My sister’s house doesn’t have a basement, but it does have a crawl space under the house. She stores food there. Organization. Storing food in this way takes an extra amount of organization. After taking apart the guest bed a few times to find the ingredient I needed, I finally made a “map” of what was where inside the bed. We put the food we used most so it was most easily accessible, and we labeled the boxes on the tops as well as the sides. It is very very frustrating to not be able to find what you need when you need it. I know there are kidney beans in my basement somewhere, because I bought them in January. But could I find them last Wednesday, when I was canning beans? No. Sigh. If you can’t find it when you need it, it’s almost like you didn’t store it in the first place. These ideas sound weird to some people, I’m sure. But we were doing the best we could with our space available. Home decorating is not one of my talents. I’m sure someone who is good at home decorating could creatively store food and still have a cute home. Article found on: The Pantry Panel by Sara R.
Many canned products now have a “for best quality use by” date stamped on the top or bottom of the can. “Expiration” dates are rarely found on canned food. Canned food has a shelf life of at least two years from the date of processing. Canned food retains its safety and nutritional value well beyond two years, but it may have some variation in quality, such as a change of color and texture. Canning is a high-heat process that renders the food commercially sterile. Food safety is not an issue in products kept on the shelf or in the pantry for long periods of time. In fact, canned food has an almost indefinite shelf life at moderate temperatures (75° F and below). Canned food as old as 100 years has been found in sunken ships and it is still microbiologically safe! We don’t recommend keeping canned food for 100 years, but if the can is intact, not dented or bulging, it is edible. Below is a sampling of how some manufacturers code their products so consumers know when the product was packaged. If you have specific questions about a company’s product, contact a customer service representative. You can find a Julian Date Calendar here. By the way, this is also the reason we’re cautioned about placing plastic food storage buckets directly on concrete. Using 2 x 4s or plywood under barrels and buckets is an easy solution to the leaching problem.